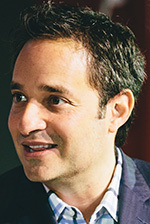 Southfield-based custom audiovisual company Bluewater Technologies has appointed Josh Linkner, CEO of Fuel Leadership in Detroit, to its board of directors. The entrepreneur will assist the board and senior leadership team on corporate governance, as well as strategy and execution for live events. At Fuel Leadership, Linkner hosts one-day events for various businesses with presenters who are people successful in their fields. The Bloomfield Hills resident has also created the businesses Detroit Venture Partners, ePrize, and Global Link New Media. Linkner is also a New York Times best-selling author for his two books, The Road to Reinvention and Disciplined Dreaming. A former jazz musician, Linkner graduated from the Berklee College of Music in Boston and received his bachelor’s degree in advertising from the University of Florida.